ronduth added a comment to T85244: Server crashes randomly. Shukari what malloc are you using? How many slot server do you have ? We've lost 1/2 our population, went from server rank 19 on game tracker to server rank 96. we"ve always been around rank 20-30. This patch issue was okay the first 7 days, but has since become a bit ridiculous. I see BI fixing other issues such as dogs, but its not paying attention to what is affecting the majority. If this goes on for much longer, we will permanently feel the effects, I am only hoping these players are playing other games/mods to fill the gap while they way patiently on BI to address said issue. If BI had a steam sale for X-mas to capture more audience, BI would not be putting up a good first impression. we crashed at 2 hours 25 minutes at 62 people. Same as you listed s1k for our server except I used other Malloc. Game Mode/Version = Altis Life 3.x heavily modified. I hope BI is looking into this we haven't gotten a response yet and I feel we have given some pretty good insight on what is going on. @Adam Is there anything you would like us to try to help with the troubleshooting? I am willing to try anything. I play rocket league, and between each match I right click lasso and trim virtual memory every 5 mins. This will prolong the crash. I've noticed though, our server seems to be ramping up on memory usage at the top of each up time hour on our server. So between top of the hours I do not have any issues with memory but then all of a sudden it starts rising quickly at top of the hour. Next step I think we will take is to continue to lower server count, to keep server stable at 3hrs. ronduth added a comment to T85229: Dedicated Server Crash. ronduth added a comment to T85141: Server running out of memory - Stack Overflow. We are having the same issues on our 100Slot server. I hope this is being heard, its rough for our gaming community. I pray for a hotfix! 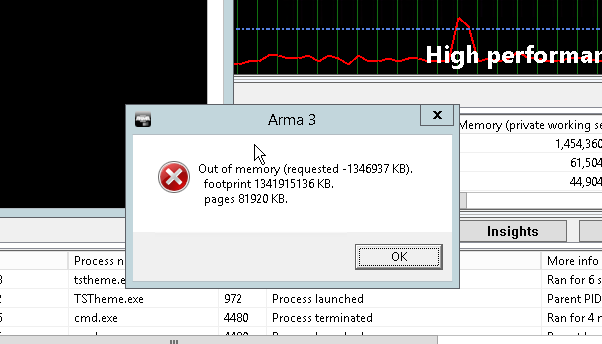 I've been playing arma 3 since march of 2014. I've paid for all your DLC's, I've been playing on this server because they represent the Arma gaming community professionally. Saying that I hope you can find a fix @Adam because its frustrating for me to see BI not taking this ticket seriously.